Based on Kathryn Stockett’s phenomenally successful and influential novel of the same name, The Help centers on Aibileen Clark: (Viola Davis), a devoted housekeeper in 1960′s Mississipi, who, after being approached to help local writer Eugenia ‘Skeeter’ Phelan (Emma Stone) write her first novel, recounts her life as a black servant in a time of extreme racial discrimination, bigotry and classism. 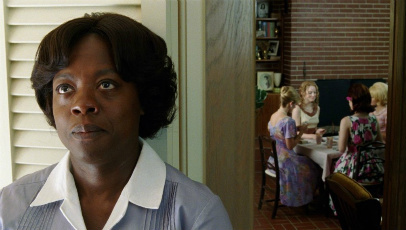 Moving, compelling and insightful, The Help is a highly commendable cinematic triumph, hitting the nail firmly on the head in almost every field: from well-honed cinematography to a beautifully serene score. Tate Taylor, who also penned the screenplay, has managed to do something of a rarity nowadays: faithfully translate a novel to the screen while maintaining those crucial elements that helped the story connect with so many people in the first place. He retains not only the satisfying emotional depth and the well-observed, authentic characterisations but also the witty yet completely grounded camaraderie shared between some of the women. All of the actresses here, including Bryce Dallas Howard, Octavia Spencer, Allison Janney and Sissy Spacek, deserve equal praise as they inhabit their characters divinely, delivering some of the best performances of the year. Special mention, however, must be paid to Jessica Chastain, Davis and Stone. Chastain, who burst onto the scene with her mesmerising performance in Terrence Malick’s The Tree of Life, proves that she encompasses the diversity, sharpness and natural prowess needed to be a Hollywood star with a heartfelt and significant performance that mixes comedy and drama with an incomprehensible ease. Davis is simply astonishing as Aibileen, and will – if there’s any justice – pick up a handful of nominations come awards season. Stone, who has previously been limited to comedic work (such as her absurdly entertaining performance as Olive Penderghast in Easy A and as Hannah in last months Crazy, Stupid, Love), demonstrates her range and skill as a dramatic actress. Nevertheless, she is still able to infuse the role with the naïveté and lovability that audiences have come to expect. The Help is a special kind of film, one that fills you with joy, all the while educating you and making you realise how much things have changed in society and how privileged our lives are in this day and age. It represents cinema in its most refined state and is likely to propel Taylor into the scintillating spotlight. What on earth does “mixes comedy and drama with an incomprehensible incredulity” mean? Your enthusiasm is great. Your adjectives are out of control. Write half as much twice as clearly and you’ll be laughing. Point taken. I appreciate the feedback. I have a habit of overusing adjectives.